Bijou Lovely: Giveaway from Stash Fabrics! 288 Giveaway from Stash Fabrics! Hello! It has been a little while since I've posted here, lots of sewing going on and no time to post! I'll have some fun things to share with you next week. Today I have an awesome giveaway from one of my sponsors, Stash Fabrics! 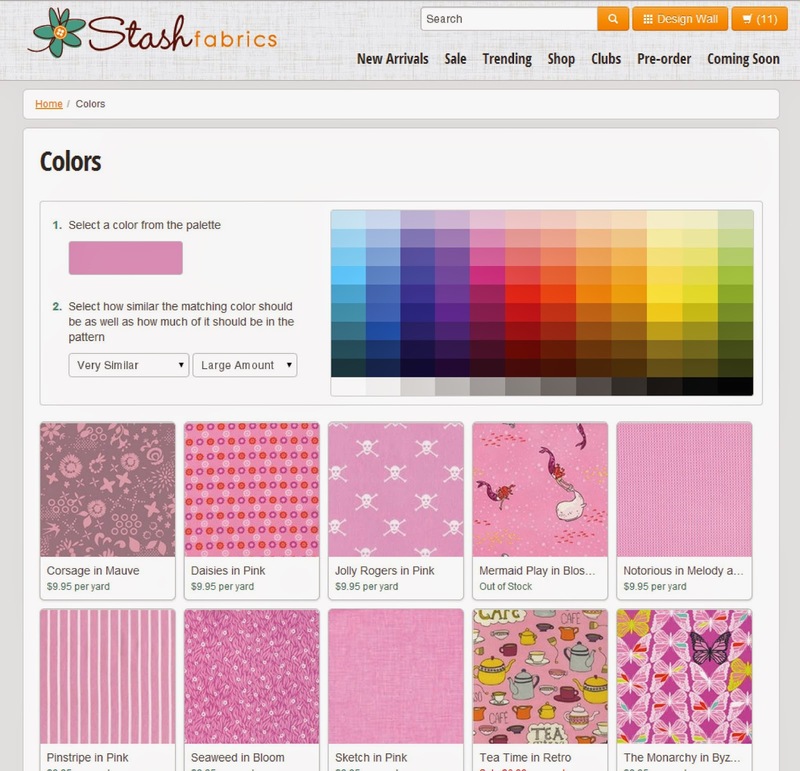 Stash Fabrics is an online fabric shop with an amazing selection, and a shiny new website! The shop just recently moved from Etsy to it's own site: www.stashfabrics.com! The new site has some really useful features when it comes to fabric shopping. My favorite is the New Arrivals page. I love being able to visit an online fabric shop and see what's new immediately, as that is usually how I shop for fabric! You can also shop by collections, designers, manufacturers, etc. and you can even shop by color, which is a great way to stock up on colors your short on, or to choose a bundle of fabrics to use in a quilt if you already have a color scheme in mind. There's a sale going on at Stash Fabrics right now where you can save 15% off clearance fabrics with the code "CLEAR 15". Bella Solids are also on sale for 20% during the month of June. There are tons of fabrics available for preorder that are releasing in July, including Cotton + Steel, Brambleberry Ridge and Far Far Away! Shipping is always free on orders over $50 too. So head over there to check it all out! Beth from Stash Fabrics is giving away a $30 gift certificate to one of you today! To enter, simply comment on this post. Tell me your favorite way to shop for fabric, what you're working on right now, or what your plans are for the weekend. Followers get an extra entry by leaving an additional comment. Please make sure to leave a way for me to contact you if you win! I'll choose on winner on Monday, 6/23. Update: This giveaway is now closed. Congrats to our winner, Paula! Thanks to Stash Fabrics for the great giveaway and congrats on the new site! we are camping this weekend. first voyage for the year. hope the camper doesnt still smell like moth balls. I live out in the country so I am mostly an online shopper. It's so easy and convenient, can't beat it. I love online shopping. I recently bought some Arizona fabric, and it is even more beautiful in person. Now to figure out a quilt design for it! Maybe I'll make some progress this weekend. I also follow your blog. I shop online about 99% of the time. I live very rural and there are not shops close at all so the 1% is when on vaca! HAPPY TO FOLLOW ON BLOG LOVIN'! HI, working on a blue+white HST's charity baby quilt! Thanks to you+Stash Fabrics for a great giveaway! Right now I'm working on a memory quilt that a friend asked me to make from her son's outgrown t-shirts and stuff. Not as much fun as working with new, beautiful fabrics but I know she will treasure it when it's done. I love to shop for fabrics online since there is such a great selection available. When I finish this quilt I think I'll be ready for some shopping! Thanks for the chance to win. I tend to shop online, because the selection is so vast! Right now I'm working on a couple gift pillows. Hopefully they'll be ready soon! I'm working on my Park Bench BOM. I typically shop online, our family is on an odd schedule so I find myself shopping after typical store hours. I am currently pulling solids and pressing like crazy to start prepping for a quilt along, my first ever! 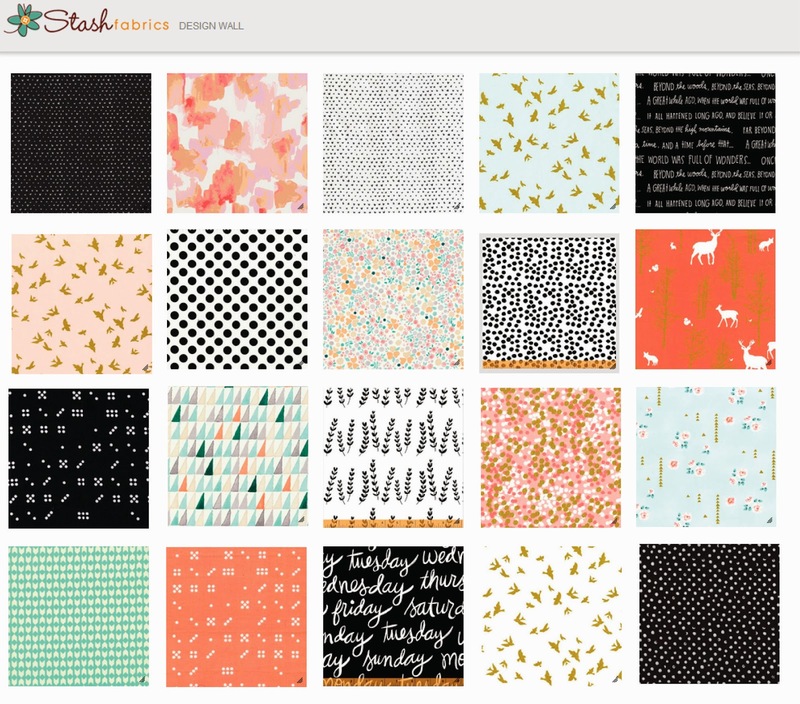 Love the design wall feature on StashFabrics when I shop online. I love being able to shop by color so that I can build up my stash in the areas that need some extras! Definitely an on-line shopper. Not many modern options around here. Just finished up an HST baby quilt last night and tomorrow I am making a Canadian Flag pillow! Working, sadly. :( get my quilting done during the week though! Hopefully will start quilting my row quilt this weekend. I happily follow with GFC. Thanks for the wonderful giveaway. I'll be at a kite festival on Saturday, and then ar a sew-in on Sunday. Both should be fun! I'm happy to be a follower of yours! Thanks! As much as I love being able to feel of the fabric I love to shop online. This weekend, I'm celebrating my first wedding anniversary with my husband! I do nearly all of my fabric shopping online, mostly because I love designer fabrics but always have to search around for sale prices and I just can't do that kind of bargain hunting at my local quilt shops. Thanks for the chance to win! My husband and I are planning on going to a food truck roundup in our city tonight! I am at Johns Hopkins today for my sister getting a bone marrow transplant with my brother as the donor. A heatwave this weekend so plenty of sewing time! I do tons of shopping online, and my favorite way to shop for it is the clearance section!! I do follow you via Feedly, thank you! I shop for most of my fabric online. Right now I am finishing up a queen sized Single Girl Quilt. I shop only online--it's fantastic! I also follow you on Bloglovin'! I am flying to Ottawa tomorrow to visit with my sister, dad and Nana - I haven't been home in 2 1/2 years so I am pretty darn excited!!! I'm spoiled for choice in London with lots of fantastic fabric shops within easy reach but I still end up buying a lot of my fabric online! I love Stash Fabrics - they are my go to when I buy fabric in the US. I follow you through InoReader. This weekend we're driving our teenager to college for a 6-week internship. I'll miss her! This weekend I am packing up to move. Not so much fun especially since I have to pack up my sewing area! But I bet it will be the first thing I unpack. :D Thanks for the chance to win. We're heading out to the Oregon coast this weekend--just a quick overnight camping trip, but so looking forward to getting away for a bit! Ooh, cool giveaway! I'm doing patio furniture cushions and toss pillows right now (to compliment my newly redone backyard), so this is very timely for me! The design wall feature is amazing. I always shop online and I find it very difficult to coordinate colors and fabric collections. But with the design wall, it makes it easy! I mostly buy online for the good selection. I always have a quilt or two going. Stash is great! I have two quilts to bind and quilt this weekend. I like to shop for fabric online by looking at new collections. I also always check the sale section! I am now following your blog via Bloglovin'. I follow you via Bloglovin'!! Thanks for an extra chance! This weekend I will be unpacking and organizing as we just moved back to the US from Panama. Thanks! I'm hoping to make a Bombshell bathing suit! I like to shop online with all the options, but I do get a little impatient waiting for packages to arrive. I follow your blog via feedly. I'm working on the Single Girl pattern and I like to shop for fabric in person, but I typically order more online. I love to shop at my LQS but with two littles, I do most shopping online. I follow your blog through Blog lovin. I really like to shop in a store if possible - I like to feel the fabric and play with colors. But I like the design wall feature and I will generally buy favorite designers online. I shop most of the time online. Wishing I could sew this weekend but I have a deadline on some work so the fun will have to wait a little :) I will have to check out some of the prints on your design wall, they're lovely! Thank you or the giveaway. I like to shop online an on instagram! I'm working on 2 round robin quilts. Got one done & hope to get the other finished this weekend so I can get it in the mail on Monday. Thanks. I'm going to Chicago on Wednesday and really need to plan my trip! Thanks for the giveaway. Family time planned for this weekend. We just had a wild adventure in the park! It's fun to shop in the l8cal shop, but going online I can get absolutely anything I want. Well I just ordered some fabric #stash, weekend plans seem endless but most are gardening and house organization related. Will wait until next weekend for new threads to arrive before sewing. Cheers! I like shopping online best, when I've had two glasses of wine uh... Right now I'm making a double wedding ring quilt, hoping to have the top pieced by the end of the month, thank you for the giveaway! I'm working on a round robin quilt. It's kind of nerve-wracking working on someone else's quilt when it's not a gift for someone. Oh, I'm so glad that you mentioned that Stash Fabrics had moved off of Etsy. They are on my favorites list to shop from as I must do all of my fabric shopping online, as we only have one big box fabric store and no LQS within an hour of our house. I'm waiting for some of the newer lines to come out, that way I can save up some money. Hanks for the opportunity to win a gift card! My not so local LQS is more into traditional fabrics, so I do 95% of my shopping online. Stash Fabrics is one of the first places I look because I love their selection and the fact that they do FQs. I love buying fabric from online shops, it lets me dream & window shop in my own time & in my pyjamas. I'm at a bit of a loss at the moment as my sewing machine is in for repairs & can't wait til it's fixed & ready for collection. Thanks for the great giveaway. Most of the time I usually have a specific idea of the fabric I want, so I like shopping online. The only exception is bindings. I usually buy those at the local quilt shop if I don't have something in my stash. I am working on a fall table topper. Thanks for the chance. Thanks for the chance at an awesome give away!!! This weekend is annual Shop Hop & my daughter's birthday. We spend the weekend shopping together. Did shop at Stash before yesterday's road trip :) One of my go to online shops. I like the convenience of shopping online, but nothing beats walking through a great quilt shop! I like shopping online for the convenience and selection, except when I am traveling. In that case, fabric is always the best souvenir! Thanks for hosting this great giveaway and thanks for your lovely blog! I follow your inspiring blog on Bloglovin! I love to browse at the quilt shops. I love to feel the fabrics with my hands and see the fabric with my eyes and see if the fabric sings to me before I buy. I do like browsing online fabric shops to see what is new on the market and to find something I have and need more of. Thank you for this great giveaway. I follow your great blog by email. Thank you again for this great giveaway! Thank you for introducing my to Stash Fabric! I really like how they have a design board available. I am a follower and thanks for the opportunity to win something. Like the way you can pick a color from the pallete for coordinating color tones. Nice being able to post another comment because I'm a follower. I'll add the design wall to my likes about the site. Working on a baby quilt. I love to shop at a local quilt shop and on line. Also working in the garden. Lots of blueberries too. I shop locally whenever I can but locally means a 4 to 5 hour one way trip. As a result I do a fair amount of shopping online. I enjoy shopping with a by colour feature as it results in a better selection than just trusting your instincts and monitor colours. I also tend to purchase collection fabric for just that reason as well. Thanks for the giveaway. I am an email follower of your blog. I'm hoping to sew couple pencil cases this weekend -- using oil cloth. Thanks! I follow you by email. Love online shopping. Local stores in a pinch - their selection is just sad. I follow on bloglovin as ebcallender. I'm an online shopper...love getting happy mail :). Today we are going to pick strawberries...yum! I love shopping in a store, but the closest one is a hour away, so I shop online quite a bit. Thanks for the giveaway. I'm a follower via email. Love your designs and color selections!!!! I would love to make a quilt for my daughters bed with some of their beautiful fabric. Lately, I have been shopping online. I am working on some extra clothes for my granddaughters Flats - which I did for her birthday last year. Will be relaxing this weekend in the lovely weather.,.. I am an e-mail follower. thanks for the giveaway. thanks fo the great giveaway! love Stash! We will be out enjoying the great summer weather this weekend while we visit with some old friends. Online shopping is great when you can get beautiful coordinated fabrics! Brand new little girl granddaughter so very excited to get sewing for her! Another pink quilt is in order!!! Thank you for this giveaway! I am spending the weekend studying! My favorite way to shop for fabrics is at a quilt shop although I love seeing all of the new fabric lines online. I love some of the ones you selected so think I'll go shopping there, too. Thanks. I love online shopping...never have to leave the house! I love the design wall feature at Stash. I am finishing up my Nested Churn dash quilt. If you happen to pick this number, I would like you to give the certificate to response number 41. Thanks for the opportunity. I follow you only email! Please give certificate to responder number 41. I love shopping with design boards so this rocks! I am bad at thinking how things will look together without seeing them together LOL! If the weather is good, I plan on spending the day in the garden. I like buying my fabric online for the best deals, but I like shopping in person too so I can feel it and see the exact colors. I am a follower and writing this from Canada - I arrived safe and sound! I buy most of my fabric online, and a lot of it from Stash (yay, Beth!). Thanks for the giveaway! I am working on some rag quilts. This weekend we are taking the babies to play with family! I'm working on a Star Wars bed quilt and a scrappy trip along quilt. This weekend i'm working on sewing up a bunch of knitting project bags to send off to people. I keep getting distracted by yarn though. Going to visit my grandson today for his 7th birthday. I follow you with bloglovin'. I follow you on Bloglovin and Instagram. Baby quilts-- we are expecting our first grandchild the first part of January!! I follow your blog and Instagram! I do all my fabric shopping online. I'd love to be able to shop in stores but here in Switzerland the choice is quite limited and the prices so high that I simply couldn't afford to quilt if I didn't order online. My favorite way to fabric shop is in my "Quilter friends" stash, where I get inspired to find coordinating prints/solids and go scour my many local quilt shops and definitely on line too. Right now I'm working on the Box Tote from Very Shannon, using vintage Jennifer Sampou "Native Plains " prints, a Peplum top for me, from April Rhodes "Arizona" collection. I'm anxiously awaiting pre orders of "Cotton and Steele" to make a lap quilt for a friend who just had surgery and will need to keep her legs warm this summer. Thanks so much for the Stash Fabric info!. Love the 20% off Sale on Solids on Stash Fabrics til th eend of June. I always needs solids. Following Stash Fabrics on Bloglovin too Yeah! I'm following you on Bloglovin in addition to email. MMM, great fabrics! Thanks so much for the chance to win. I do love buying fabric on-line, although in-person shopping is fun too. Hey, I just love buying fabric! I follow your lovely blog on Feedly!